A dominant linebacker at Virginia Tech over his tenure there from 2004- 2008, Xavier Adibi was drafted in the 4th round of the 2008 by the Houston Texans. Adibi was named to the the All-ACC team in 2006 and 2007. In the latter year he was also named All-American for his efforts. A hitting machine with good speed in coverage and instincts, the knock on Adibi is his read and reaction time to offensive game plans. Xavier has been hampered by nicks and tears since he was drafted, playing in only 7 games in 2008, making 35 tackles (27 solo) . He’d sit on the bench for the majority of 2009, but in 2010 he’d play in 11 games making 22 tackles and 2 forced fumbles as the Texans were forced to shuffle around linebackers when injuries decimated the middle three. Things finally started to look better as Adibi in the final contest of 2010 against Jacksonville stepped in and make 5 tackles and 3 assists. Truly Xavier has become an ‘X-Factor”, with the Texans shift to a 3-4 alignment under new defensive coach Wade Phillips, it is unknown where he figures into the team’s future plans. With Adibi’s size, frame, and familiarity to the 3-4 defense from VT, it could be possible that he slips back into an inside linebacker role. 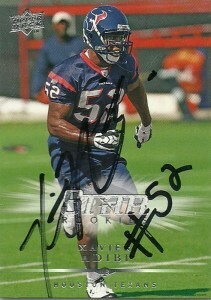 UPDATE 12/6/2011- Xavier would be among the final cuts of the Houston Texans in 2011. He’d be claimed off of waivers by the Minnesota Vikings.